The recent Methodist Hospital Foundation’s 24th annual Mardi Gras Food Fest at Sirona’s Restaurant in Santa Anita Park raised more than $230,000 for cancer services at Methodist Hospital of Southern California, a record high for this annual beads-and-boas celebration. A sell-out crowd of 1,100 people attended Mardi Gras, which also set records for highest attendance in the 24-year history of the event. The foundation honored internal medicine specialist Dr. Dino Clarizio, and his wife, Hope, as the honorary King and Queen of Mardi Gras. A record 67 event sponsors, led by Mardi Gras title sponsors Arcadia Gardens Retirement Hotel and Arcadia Healthcare Center, helped fill the room. 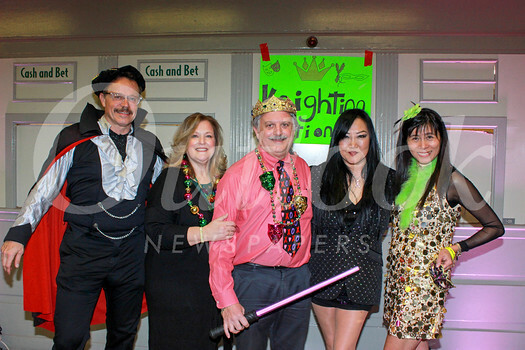 Event co-chairs Sophia Chan, Mark Hafeman and Patty Soldo and the members of the 2019 Mardi Gras committee created a festive party atmosphere for all to enjoy. Thirty-one of the San Gabriel Valley’s most popular restaurants participated in Mardi Gras by sharing a delicious variety of foods throughout the evening, while patrons also danced to the 80’z All Stars band, which played two encores for the lively revelers. The Mardi Gras parade included members of the Arcadia High School marching band, who led the King and Queen, the Mardi Gras planning committee, futboleros and dancing girls to the stage for a celebration during festivities.